Imagine that a band you’ve always wanted to see (or a musical or car show or sporting event… whatever floats your boat) arrives unexpectedly in your area. Normally, this band (or musical or car show, etc.) plays venues 1,000 miles or so from your home, so its appearance within an hour of your home is not only fortuitous, but convenient. Going to see said band (or whatever) would be no trouble at all really, while affording you the opportunity to see other acts you also find entertaining. Would you go? Now what if you went, but the band canceled at the last minute? These questions are roughly analogous to ones I’ve had to grapple with for the last two weeks. 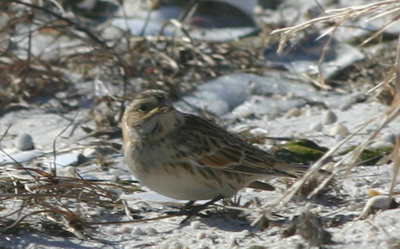 That’s about how long ago a Smith’s Longspur turned up at Jones Beach State Park on Long Island. Calcarius pictus is a tundra breeder that migrates through the Midwest to wintering grounds in southern portions of the central United States. It is most assuredly not a bird of the Mid-Atlantic. In fact, this bird’s arrival served as only New York State’s second record of Smith’s Longspur. I really was willing to take a pass on this errant emberizid. After all, though the longspur looks brilliant in its black, brown, and gold breeding plumage, it is, in winter, the consummate little brown job, utterly undistinguished. There was also the little matter of the weather, uncomfortably, unrelentingly cold. Last but not least was the philosophical complications of twitching; my passion for listing may continue unabated but my interest in chasing birds that through misfortune or mismanagement just aren’t where they’re supposed to be seems to be waning. But then Corey called. Corey lives up in Albany, but is presently birding a tear across the Empire State. Lucky for us, he’s just started a blog, lovely dark and deep [editor’s note: that blog is now defunct because Corey writes here] to recount his many adventures in avian observation. He and a friend were taking a tilt at the Smith’s Longspur and wanted to know if I was interested. Well, I’ve never NOT seen a life bird when birding with Corey, so I liked our chances working together. Since he and his buddy, Will were driving down from Albany, I decided to scope out the Coast Guard Station before they arrived on the off chance something interesting popped up. Too bad I hadn’t considered the bitter arctic wind howling out of the north. Only Buffleheads seemed willing to brave the choppy bay, while Canada Geese huddled with Herring Gulls for warmth. Suddenly, winter birding didn’t seem like such a great idea. Conditions went from bad to worse when we pulled up to the Theodore Roosevelt Nature Center at West End 1, where the longspur has been holding court, only to find the entryway barricaded, like it is every Monday. It would have been nice to know that. We did spot plenty of Horned Larks during our long, frigid walk from West End 2 to West End 1, along with huge numbers of Yellow-rumped Warblers intersecting like spry Venn diagrams with equally impressive hordes of House Finch. We also noted a couple of different sparrow species, Song and Savannah, to which we eventually added American Tree and House. The south shore of Long Island faces the ocean, so at least we had that cruel, cruel wind at our backs when we finally arrived at the Nature Center to seek out the Smith’s. Ed, the enthusiast who first spotted the rarity, was among the very few birders in attendance. This fine gentleman got us onto Lapland Longspurs, my first ones ever, but hadn’t seen the Smith’s. I’ll put you out of suspense by reporting that we never did see that bird. We did, however, encounter Black-bellied Plovers, Snow Buntings, and loads more larks. The raptors of the day were Northern Harrier and Sharp-shinned Hawk, the common birds Mourning Dove, Northern Mockingbird, and the usual winter gulls. Congrats on the life birds, Mike. Lapland longspur is still on my wishlist, but I probably have miles to go to find one. Thanks, John. If you’ll travel about 256 miles, you can get one for sure at Jones Beach. Thanks Mike for the most interesting analogy for twitching that I’ve ever heard, the rock band. It shines twitching in a much better light for me. And send the Lapland Longspurs back home soon, my deck misses them. And you know, with a trip up here in the spring you could see them in all of their breeding coloured glory. Might even be able to find you a raven or two. Clare, you know I’m looking forward to my inevitable pilgrimage to the House, and not just for the arctic avifauna. I still remember how cold it was. I still remember that Corey never saw that Smith’s Longspur!